Tallulah’s catering is a bijou company based in the Shropshire hills and trying to do things a little differently. We only use fabulous, seasonal and local ingredients to create innovative food, packed with flavour and popping with colour. Our staff are super friendly, professional people who love weddings and have incredible attention to detail. From our front of house team to our kitchen, we work together as one big family to deliver a day you will remember forever. There is nothing we love more than to chat food, so if you have dreamt up a menu for your big day and need someone to help turn those dreams into a reality, please get in touch! We are on Facebook and Instagram, follow us and see what we’re up to. Tallulah catered for our wedding this weekend, dealing with 150 hungry guests for 24 hours. From start to finish she and her team have been totally incredible. From the initial tasting all the way through to the finished product, we have been blown away by her friendliness, flexibility, and talent. The canapés were divine and plentiful; our wedding guests commented that this was the best wedding breakfast that they have ever tasted (and it is wedding season in our friendship group at present so there has been a lot to compare it to! ); and the Sunday brunch was absolutely amazing and raised even the most hungover guest's spirit (Tallulah makes a mean Bloody Mary!). Everything was local, fresh and prepared with care before being beautifully presented and served with efficiency and professionalism, but also with a personal touch. We couldn't recommend Tallulah highly enough for any function large or small. Thank you for making our wedding delicious!! I wanted to drop you an email to say a MASSIVE THANK YOU for being part of our wedding. We are totally overwhelmed by everything you have done for us, we could not be happier or more grateful. The meal you made for the evening before the wedding was out-of-this-world delicious! We wanted something informal but a bit exciting and the tagines were perfect. Our wedding breakfast received so many compliments, with some guests describing it as the best wedding food they’d ever had. Everything was so flavourful and delicious, it was all presented beautifully and the sharing style kept everything feeling relaxed, which is exactly what we wanted. We loved the idea of bowl food for the evening and it was perfect. Another thing we loved was that you served the wedding cake on cake stands on each table. We were expecting it to be set out on a platter or served on trays like the bowl food, so this was a nice touch that we really appreciated. We feel that you guys offer the perfect balance of traditional wedding food while still being a little break from the norm. It’s not gimmicky or pretentious, it’s just really flippin great food delivered in a stylish and relaxed way and we love that. However, above and beyond all things, the thing we were the most chuffed with, is you guys! Tallulah, Shay, Rachael, the whole team. YOU ARE ALL AMAZING! You’ve been open and friendly while still being constantly professional. Every email has been answered so quickly, you’ve been flexible with us and did a wonderful job providing vegan options (Rosie was particularly enthusiastic because she never gets good vegan options!) Nothing has been too much trouble for you. When it came to picking wedding suppliers, our number 1 priority above all things was to work with nice people. Not just people who are good at what they do, but genuinely nice people. I know I said this on the day, but you guys have been our absolute favourite supplier to work with. Working with you has been a dream and we could not be happier or more grateful for everything you have done for us and for being part of our big day. 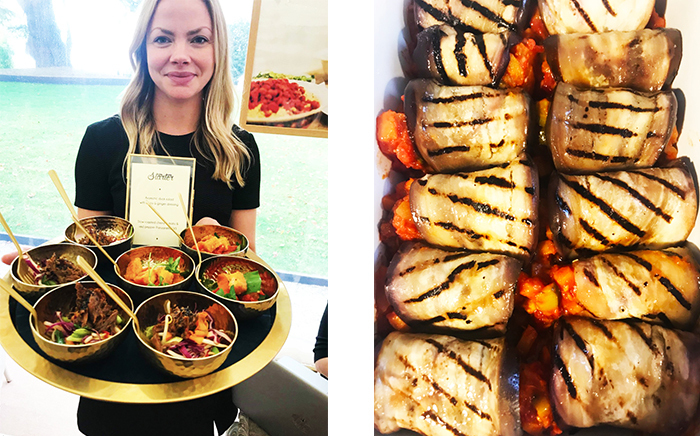 Tallulah and her lovely, lovely team provided us with the for the most outstanding food at our wedding on Saturday at the gorgeous Garthmyl Hall. Everyone I spoke to commented on it, from how delicious the canapés were, how excited they were about camembert, how uniquely tasty and flavoursome the mains were and then the burritos... wow. From a personal point of view, I can’t express how much it meant to me that I could eat food that was actually so frickin’ tasty, I did a happy dance with each bite. Eating away from home causes me quite a bit of stress, as I can never fully trust that the waiters/chefs have got it right, and most often they don’t as I’ve been poorly a few times afterwards. To be able to eat a version of everything, and not only that but to taste flavour... it truly made my day!!! Tallulah’s staff were so attentive in seeking me out so I had the right food; they were an absolute credit to her. Tallulah took my dietary requirements very seriously and adapted/tweaked my food so I could just be “normal” for the day. Amazing feeling.From the very early email conversations, right up to the very end, Tallulah was quick to respond, and always helpful and responded in a way that left me fully satisfied with whatever I had asked about. I am so glad we chose Tallulah and the team to cater for the most special day of our lives so far.